The Water Reclamation and Biosolids (WRB) Division will be recognized as a Gold-Level Partner of the National Biosolids Program (NBP) at WEFTEC 2018 in New Orleans. The NBP advances environmentally sound biosolids practices geared to go beyond regulatory compliance requirements with a focus on continual improvement. Gold Level Partnering organization’s programs have been verified by a 3rd Party Certification Audit process based on the ISO 14001 standard. The 2018 WRB NBP team included Jennifer Ward, Allison Becker, Jerry Yakel, Nate Ader, David Wiedeman, Nick Russell, and Jason Graham. Biosolids are a nutrient-rich organic material created from the biological and physical treatment of wastewater. They are the removed solids from the wastewater treatment process, which meet strict state and federal standards for organics, metals and pathogen removal. Biosolids can be used to improve soil structure and water retention, and also are used as a slow-release fertilizer. Currently, Fort Collins Utilities applies 70 percent of its biosolids on Meadow Springs Ranch and 30 percent on private farm land. Meadow Springs Ranch is a 26,600-acre working cattle ranch near the Wyoming border, owned by Utilities, which serves as an integral part of the wastewater treatment process. It was purchased in 1990 and provides Utilities with the ability to recycle the majority of biosolids produced by the wastewater treatment process. After 10 years of studies, monitoring for weather, surface water runoff quality and groundwater quality, full scale “routine” biosolids operations began in 2001. The City produces approximately 2,355 metric dry tons of solids per year (more than 579 semi-truck loads). Four times per week, semi-trailers of biosolids are trucked from the Drake Water Reclamation facility to the ranch and spread on concrete pads for solar drying. The solids are solar dried from a consistency of wet earth to a dry dirt (25 percent to 90 percent total solids) and are applied to the rangeland at a rate of two dry tons per acre. Utilities staff routinely sample soil and groundwater, using results to determine management practices on rangeland, and to comply with state and federal regulations. Watch a video of the process at Meadow Springs Ranch. 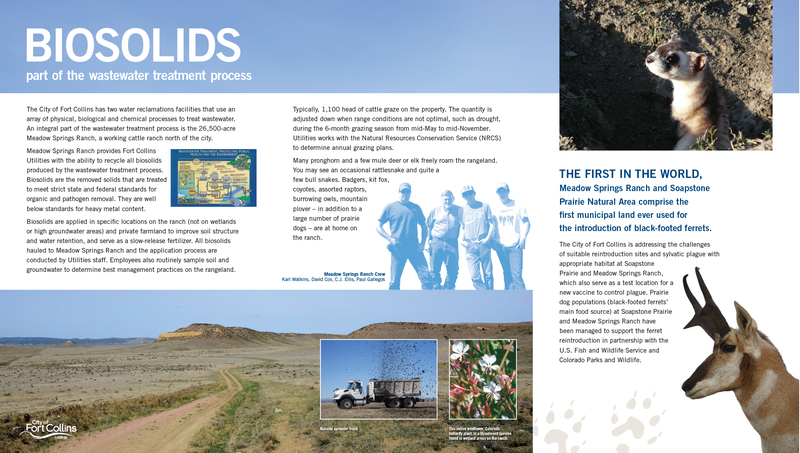 Learn more about the biosolids process and the introduction of the endangered black-footed ferret at Meadow Springs Ranch. The Water Reclamation and Biosolids Division (WR&B) is committed to proactively addressing the challenges that will arise with respect to biosolids management in the future, especially in respect to city growth, transportation and public acceptance. In 2014, City of Fort Collins WR&B joined the National Biosolids Partnership (NBP). The NBP is a program that advances environmentally sound biosolids management practices. This helps the City’s current program by improving our current biosolids program to achieve national recognition through an increase in awareness of land stewardship and by providing areas of improvement and best practices for biosolids reuse. Click here to view the NBP Code of Good Practice. Pursue sustainable and beneficial reuse options which protect worker health and safety, the environment and public health, through a cost-effective program. Be sensitive and responsive to public concerns. Maintain 100% compliance with all applicable regulatory requirements. Strive for continual improvement in its Beneficial Use program while providing flexibility with respect to end use. Periodically evaluating beneficial reuse options that provide potential for improved efficiencies or better meet the needs of the community. Providing adequate training to personnel associated with the biosolids management programs.